Special Containment Procedures: SCP-XXXX may never be touched with bare hands. Rubber gloves with at least half a millimetre in thickness are a requirement while handling SCP-XXXX. Although some pulsing might still be noticeable, it won’t be as addictive when protected. If any staff member seems to spend an unreasonably high amount of time with SCP-XXXX please contact authorized personnel immediately. Description: SCP-XXXX has the appearance of an ordinary kitchen knife with a 22 cm blade and a 12 cm long handle. The broadest point of the blade is 4 cm. No brand name can be found anywhere on the knife. 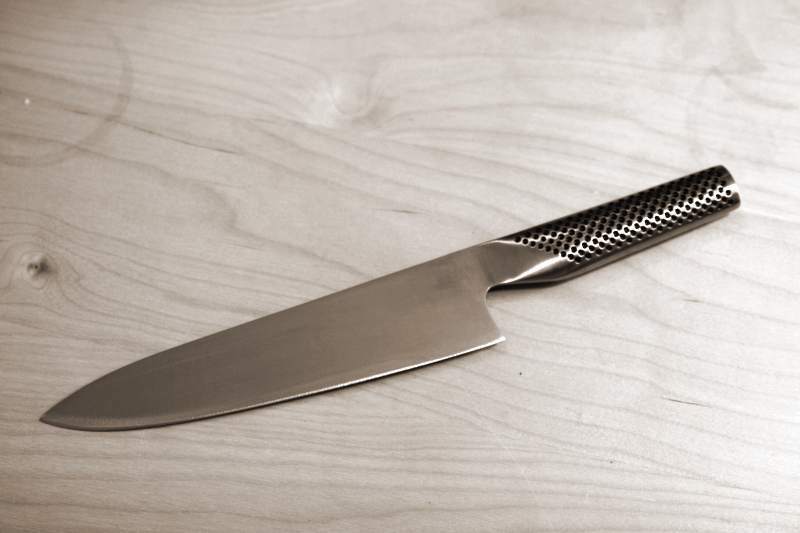 When gripping the handle of the knife, one can feel a strong pulse with a similar rate as an increased human heartbeat. Any human being holding SCP-XXXX will find this very satisfying and after regular exposure to this feeling, one will start to develop a very strong addiction to it. While the addiction grows, the feeling will get weaker rapidly and after some time the subject will get no further satisfaction by holding the knife. The subject, however, desperately wants to continue to feel a pulse and will try, for example, feeling his own heartbeat at his wrist or neck, feeling the heartbeats of others or feeling some kind of artificial pulse. At first it seems to work and he gets satisfaction again but after a short period of time, it won't be enough too. At this point, if he can’t feel a heartbeat in his hand for a long time, he will get withdrawal symptoms like depressions and will start to behave very violently or irrationally. At the final stage of the addiction, the only method to satisfy the subject for a brief amount of time is stabbing another person into the chest and feeling his victims pulse through the knife. SCP-XXXX will then act as an amplifier to any kind of vibrations and intensifies the raising heartbeat travelling through the blade. Also, any subject exposed to SCP-XXXX will pierce his victim with very high accuracy. He will not hit the heart directly but at the [DATA EXPUNGED] where one can feel the heartbeat the best. The victim will die shortly after the attack and the subject will have no further interest in him. SCP-XXXX was found in the belongings of detective █████ ████████, who unexpectedly murdered several people. He was investigating the case of a serial killer, who stabbed ██ citizens the same way as described above. After the detective had found the knife in the killers apartment, he also murdered █ persons before the connection between both killers and the knife was discovered. "At the time I was investigating this case of a serial killer. He was a real psychopath - or so I thought back then. He had a fairly normal life and usually didn't show any signs of violence but every once in a while he just snapped and killed some random person, who happened to cross his path. And even though he had no medical or military training, he managed to always stab his victims in the exact same and completely lethal spot. There were never any signs of a fight or that the murder was planned in advance, so it must've happened spontaneously and quickly too. We were totally baffled by this. How can someone stab a totally random person with this accuracy? He never left any traces and we failed to establish a connection between the victims. It was really hard to find him but like so many serial killers, one day he made a mistake, which subsequently led us to him. We were all quite relieved that, after ██ dead citizens, we could finally arrest him. At our interrogations he always seemed like a fairly nice guy and you wouldn't believe that someone like that could ever harm anybody. However, he didn't even try to deny what he did. He said it was for him a necessity like food or water. That he couldn't live without killing every now and then and that he didn't feel any guilt. He also kept going on about this knife and how amazing it felt when he was holding it. I was just completely stunned at how open he was about his murders. You know, every killer reacts differently when he is caught, but this… This was totally new to us. Before his trial I had the order to investigate his apartment and search for his knife. The killer tried to warn me about it but I didn't believe him. I just wanted to get this case closed and get some rest. So I did what I was told to do and found the knife right under his pillow. Since he confessed already and since I was so tired, I didn't even bother to put some gloves on. I immediately remembered what the killer tried to warn me about but it felt way too good to put it down again. I felt so happy… so peaceful. I wanted this moment to never stop. I simply had to steal it, I wanted to feel this pulse forever. And at work I would say that I didn't find it, that he possibly got rid of it. So, in the following days I spent every free second with this knife. I was just sitting there at home, holding it in my hand, feeling this heartbeat, feeling so good. But the longer I held it, the weaker the pulse got and one day I couldn't feel it anymore. At this point, I was already so addicted to it, that I immediately started to freak out. I remembered how the killer said that he killed only because he wanted to feel this wonderful pulse again and how the knife guided him and how good it felt. Then I freaked out even more. I didn't want to become like him. I didn't want to kill random people on the street. I asked myself over and over again, "Why does it feel so good? Why do I need it so badly? Isn't there another way? Do I have to kill somebody?" And the longer I didn't feel that heartbeat, the more depressed I became. I tried several different things to feel a heartbeat but nothing worked. I knew what I have to do. Finally, I gave in to this desire. I was tired of always resisting the urge. At one night I picked up the knife and went down the street. I blindly stabbed the first person who came across me. And as the knife went through the exact same spot as in the other murders, I could feel this satisfying and so wonderful heartbeat. My victims heartbeat. I could feel it so intense, like I never felt a heartbeat before. For those last seconds for my victim - It was a young and attractive woman, by the way - I felt like I went to heaven with her. Even better… Like I'm able to do anything. Like I was god… I hoped that it would never stop. I wouldn't know how to live without it anymore. But as soon as the victim passed away, the feeling ceased as well. After this experience I looked at her for a moment. Lying there… Dead… I didn't feel any guilt. Just like the other killer. I looked at her and wondered whether she suffered or whether she screamed. I couldn't remember. I was too overwhelmed by that feeling to notice anything around me. But I wasn't interested in her anymore. I just left her lying on the walkway and returned home. The following days I didn't feel the desire. I pretty much didn't feel anything. I only wanted to take a break. I really wanted to spend some days far away from home. So I flew somewhere remote to get some rest. At first I thought this feeling was finally gone but after a couple of days I started to feel this urge again. This tingling in my hand. The longing after a pulse. And I knew what I had to do to feel it again. At the airport on my way back home they arrested me. They discovered that it was me after they found out that I made holiday where those new people with the same stab wound were killed. And there I am now. Arrested and on death row because of that damn knife. I hate it so much! But then again… It made me feel so good… Why would I hate something that makes me feel good? Anyway, a few days ago I heard that the other killer was released because they thought it was me all along. He committed suicide shortly after that because he couldn't live without the knife anymore. I can only hope to die very soon as well." 1. Photo with cc licence from Flickr by user "yashima". Slightly altered by me.